Tasteful smoke? Conveniently located nebula perhaps. Anyone see which way John T. Phillifent? The golden gent with the buttocks for a forehead is in some kind of symbiotic relationship with the sequin salamander there. He uses his spear to gently clean the salamander’s teeth and eats the particles of food extracted thereby. Isn’t biology just the most wonderful of sciences? Checkers, chess, who cares. On Argent pawns can become kings. Presumably the staff is The Rod of Argent? You can hold your head up high reading this one on the bus. Dude is made of gold and he can’t afford to buy a decent hair piece? It looks like an octopus is trying to swallow his forehead. Someone should tell Golden Guy about the dangers of keeping your privates in the cloud. This planet makes it’s own rules! Pawns are crowned. Crowns are pawned. Prawns are cowed. Cows are pwned. Paws are claws. Crows cawed. And scowls are frowned upon. I am not exactly sure what the planet is doing, but it is good to see a planet being so proactive. What makes this blurb so colossally stupid, is that it was so obviously written by someone who thought it was very clever. Ah-ha! Now we know how Hunt the Space-Witch caught her case of rocket crotch! King of Argent? That’d be Russ Ballard. So maybe blue-chick ought to hold her head up. Is this Mr Tomorrow again? 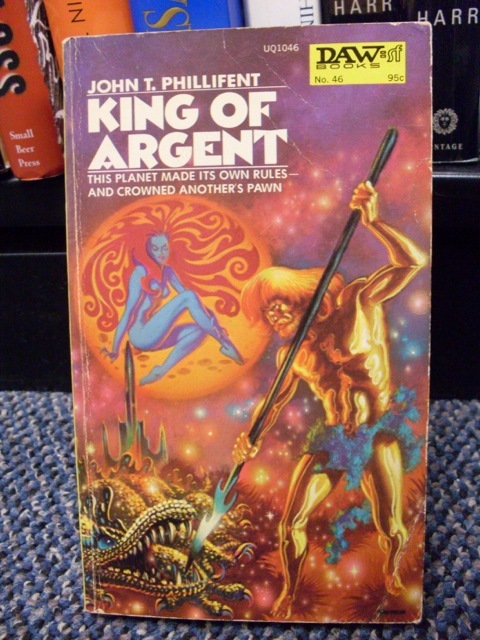 That can’t be the King of Argent on the cover, as ‘argent’ is heraldry-speak for ‘silver’, not gold. Is he supposed to be fighting that creature? If so, he doesn’t look very interested in doing it. I’ve seen people more excited about hoeing a row of potatoes. Shouldn’t he be the King of Aurum? Why the heck Argent(um)? @Bibliomancer, THX 1138—yes, and Rod Argent takes us into the world of psychedelic rock and hints at what was perhaps the artist’s unconscious thought trail, since I knew that rocket (and a hint of that hair) looked familiar. Can’t imagine where the man comes from, though. ‘Agent of Kring’ would be much more catchy.